(The Root) — A funny thing happened on the way to resolution of the New Orleans Saints' alleged bounty program: The matter didn't go away when NFL Commissioner Roger Goodell suspended four players earlier this month, after previously sanctioning the team and management. The NFL had spoken, and that was supposed to be that. Goodell reinforced his reputation as an iron-fisted ruler who liberally doles out sentences, serving as judge, jury and executioner. The Saints' players would take their medicine, just like the coaches and general manager took theirs, and the issue would die. But Jonathan Vilma didn't get that script. The linebacker and so-called ringleader, who received a yearlong suspension, has gone rogue. He slapped Goodell with a defamation lawsuit on Thursday, claiming that the commissioner made false statements that trashed Vilma's reputation and hindered his ability to be hired as a pro-football player. The suit claims that Goodell "relied on, at best, hearsay, circumstantial evidence and lies" when he made comments about Vilma regarding the NFL's investigation. According to the league, Vilma offered $10,000 in cash to any player who knocked Arizona quarterback Kurt Warner out of a 2009 playoff game, and he pledged the same amount to anyone who knocked Minnesota quarterback Brett Favre out of the following playoff game. "Commissioner Goodell opted to make very public and unfortunately erroneous allegations against Jonathan," said Vilma attorney Peter Ginsberg. "By making these false and public statements, he has significantly harmed Jonathan's reputation and ability to make a living. By suing Commissioner Goodell in court, Jonathan opted to use a fair playing field where he has procedural rights and protections to remedy the harm Commissioner Goodell has done to him." Vilma has repeatedly denied the allegations against him and did so again Thursday. "As I've said before..I NEVER PAID, NOR INTENDED TO PAY ANY AMOUNT OF MONEY, TO ANY PLAYER FOR INTENTIONALLY HURTING AN OPPONENT," he wrote on his Twitter account. The lawsuit could force Goodell to release his evidence in the bounty scandal. The league's critics have lamented the lack of proof offered thus far, beyond essentially the NFL's saying, "Trust us, the Saints are guilty." Trotting out a former U.S. attorney, Mary Jo White, this month to corroborate the league's findings wasn't very convincing. The league's investigation of the three-year pay-for-pain system provided "an unusually strong record" and came from people with "firsthand knowledge and corroborated by documentation," said White. " … The factual basis for the sanctions is quite strong, in my opinion." But folks want to reach their own conclusions. 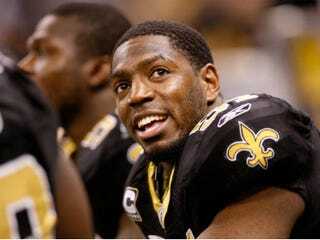 Maybe Vilma's lawsuit really is a sign of the Saints' arrogance, and he just wants to know which players came forward. Either way, his rights in a court of law supersede Goodell's status as the NFL's all-knowing, all-seeing, all-powerful head honcho. If the commissioner has to squirm for a change, that's not a bad thing. It might help him understand how the players feel.